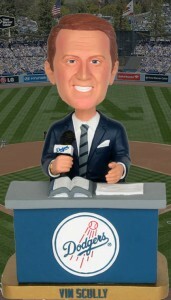 Happy 88th birthday to the legendary Vin Scully, who has called far more no-hitters than any other baseball broadcaster. Scully has sat behind the microphone for an unprecedented 20 no-hitters and three perfect games over his 65 year career. The longtime Dodgers play caller, who was born in the Bronx, announced earlier this year that 2016 would be his last year behind the mic. Mark Haft liked this on Facebook. Susan Carroll liked this on Facebook.